Arthur McKay is proud to welcome Aaron Bryson on to our award-winning apprenticeship scheme, following his recent impressive performance on his work placement. Sixteen year-old Aaron Bryson joins the organisation today following his successful completion of the Get into Electrical Installation course at Edinburgh College. 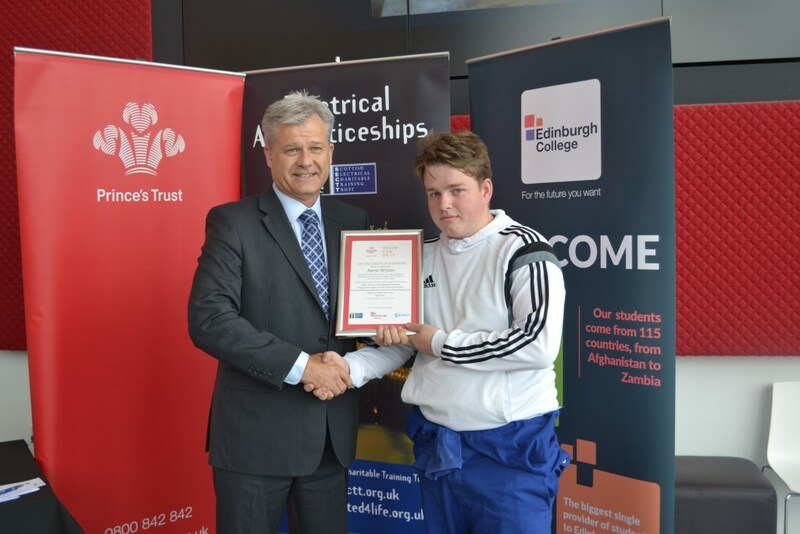 Get into Electrical Installation is a partnership between Edinburgh College, Prince’s Trust Scotland, the Scottish Electrical Charitable Training Trust (SECTT) and SELECT – the trade association for the electrical contracting industry in Scotland. It is a six-week vocational course at Edinburgh College, designed to give unemployed youngsters a taste of life in the industry and help boost their employment prospects with local employers. With its specific focus on the electrical installation sector, it also offers sector-specific work experience and a guaranteed interview with a Scottish electrical contractor on successful completion of the course. Good luck Aaron and welcome to the team! For more information on courses offered by Edinburgh College, visit their website. The Prince’s Trust is committed to helping young people who are unemployed or struggling at school to transform their lives. For more information on the “Get Into” Programmes, see their website. SECTT run the only industry approved training scheme for electrical apprenticeships in Scotland. See their website for more details. SELECT is the trade association for the electrical contracting industry in Scotland. For more information, see their website.